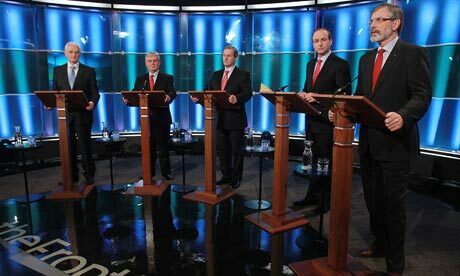 The general election due to take place in Ireland is likely to be one of the most extraordinary we’ve ever had. Not only is the economic situation more consumed by more dire straits than Mark Knopfler’s studio technician, but confidence in pretty much every major Irish institution is hanging comically round the ankles. So while people may be united in loathing, their voting preferences are all over the shop. Fine Gael are riding high as a party and Enda Kenny, previously only marginally more popular than shin splints, is now getting kudos for not screwing up more than anything else. Labour are slipping behind, with even Eamon Gilmore’s personal popularity falling. Fianna Fáil are hoping their numbers go up thanks to Micheal Martin, the theory being it’s very hard to be angry at somebody who agrees with you and doesn’t argue back, but it’s not working. Sinn Féin and the United Left Alliance are picking up support in the polls but that tends to fall off when people actually reach the ballot box. Add to that the multiple (some might say numbing) TV debates this year, and with offhand comments all but impossible to bury now in our internet-omnipresent age, there will also be an unprecedented opportunity to see parties and party members screw up. And while the state of the parties will no doubt leave us wholly exasperated, that leaves the way open for a group unusually prevalent people in Irish politics anyway to really make their mark this time: Independents. Due to Ireland’s proportional representation system it’s much easier for an independent to get elected here than in the UK or the US, and this time round it’ll be easier still. Traditionally, independent candidates are also either ex-members of parties with a strong local base like Neil Blaney or Michael Lowry, a campaigner on a particular community issue like saving the local hospital such as Tom Foxe or Paudge Connolly, or left-leaning candidates with a broader focus who don’t correspond to any label and benefit from the anti-establishment tag political independence gives them, like Tony Gregory or Finian McGrath. And of course, some independent candidates are just plain nuts. But this time, the “feck-ye-all” sentiment affecting parties, combined with a concerted effort in some quarters for a technical Independent group of TD’s to keep them honest, means that an unprecedented number of non-party politicians look likely to take their seats in the Dáil next time. And while big names like David McWilliams and Fintan O’Toole have declined to run, there are more than enough individuals willing to pick up the mantle who could win a seat, making a political landscape in flux even more volatile. Senator Shane Ross is one of the bright lights of the field, and he’s almost certain of getting a seat in Dublin South, but there are plenty of others in the capital who could be sitting next to him. Markets analyst Paul Somerville, youthful muso Dylan Haskins and the Christy Moore-backed Mannix Flynn are all running on their own steam in Dublin South East, one of the most consistently competitive and difficult to call constituencies in the country. Across O’Connell Bridge in Dublin Central ex-Sinn Féiner Christy Burke could not only embarrass Mary Lou McDonald (who couldn’t win a Mary Lou McDonald lookalike contest) but Fianna Fáil too. Now Bertie Ahern has absconded Fianna Fáil’s candidates are sitting TD Cyprian Brady, who got fewer votes last time than a High School Class President but got in on Bertie’s coat-tails anyway, could cancel out local councillor Mary Fitzpatrick, allowing Burke to come up through the middle. In Dublin North East, the leading light of the motley New Vision alliance might convert his burgeoning media profile into a decent showing. Beyond the pale dishevelled property developer Mick Wallace might make something of it in Wexford, while down the road in Waterford popular city councillor John Halligan is looking very good for a seat in a constituency full of new faces and lacking any real big hitters. While in Cork there are a throng of independent candidates running, they’re in a crowded and talented field which should hamper their progress, but in the rest of Munster their chances are better. Tom Fleming and Mattie McGrath are ex-Fianna Fáilers and in spite of their baggage will still probably poll rather respectably, though probably at the expense of another Independent, Michael Healy-Rae, son of former Minister for Combovers Jackie. In Clare James Breen, who crashed out of contention in 2007, rallied back enough at the local elections in 2009 to put him back in the mix. Galway City might return two independents, as Labour rebel Catherine Connolly and PD survivor Noel Grealish both look in good shape, while further up Connacht Micheal Kilcoyne could cause an upset in Mayo. In Roscommon-South Leitrim, Luke “Ming The Merciless” Flanagan, one of the most well-known politicians in the country for various reasons, might raise the amount of independents in the Dáil and the gaiety of the nation if he finally makes it this time, and up north in Donegal South West Thomas Pringle will push hard for the third seat after a strong showing at the recent by-election. In the rest of Leinster not many indies stand out, but former Fianna Fail councillor Kevin “Boxer” Moran could throw a cat among the O’Rourkes, while the rather sedate race in Kildare South has just been livened up by Clifford T Reid, who ran in the 2004 European elections under a “Stop The Paedophiles” ticket. Paddy Kennedy in the same constituency stands a better chance of being elected, while in the bordering constituency of Kildare North Catherine Murphy is in great shape to win back the seat she lost in 2007. If even a fraction of the candidates I’ve mentioned get elected, and if a few other pop a surprise out of nowhere, then you would have a very strong group of between 10 and 15 independents who, given the fractious state of the big parties, could wield enormous power in the formation of the next government. And with such a large group with such varied placings on the political spectrum, that’s where the fun begins.